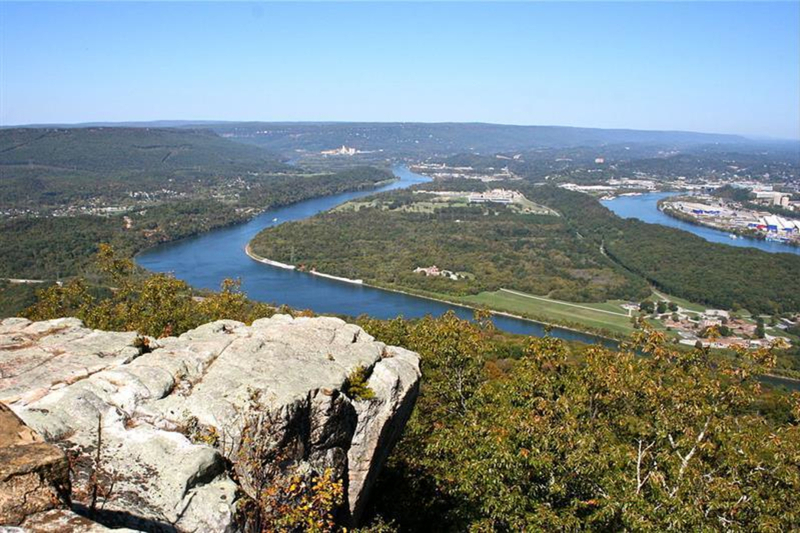 Riding Moccasin Bend is a cycling tradition in Chattanooga, especially for those wanting to a place for some quick, flat sprints and training. It depends on how many loops you'd like to do. It really depends on how far you want to go, but the roads are flat, smooth, and easy, so it's easy in that regard. The two-lane down the iconic Chattanooga peninsula known as Moccasin Bend is a drag strip for road bikes: a straight, almost flat and usually smooth ribbon of asphalt where your wheels seem to want to roll a little faster than usual. 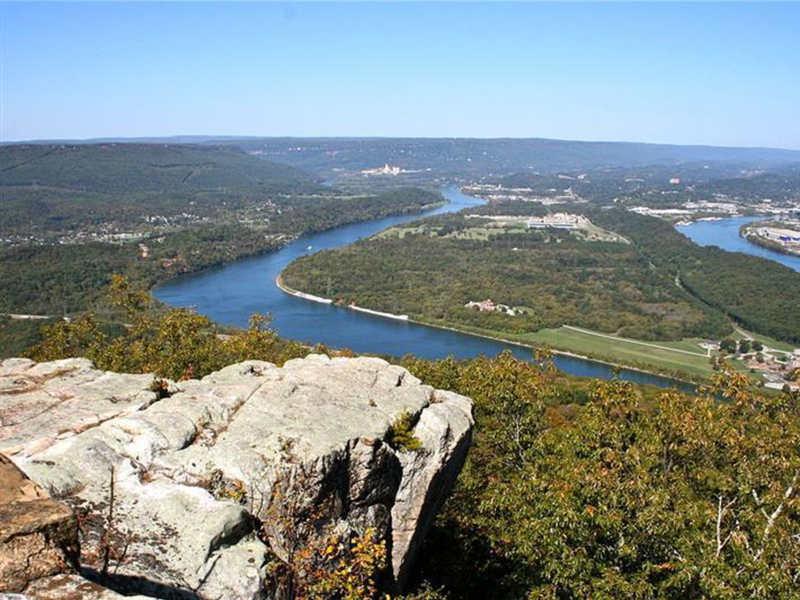 Within easy range of downtown, Red Bank, and the trendy North Shore, the Moccasin Bend Loop can be ridden by anyone who can tolerate the occasional passing vehicle but it's more often a playground for jerseyed cyclists riding fast and free. If you park on Hamm Road as most do, ride a half mile and then turn south towards Lookout Mountain, it is 1.75 miles down to the guard shack at Moccasin Bend Mental Health Institute. As you roll past the golf course, along the shaded pavement through the woods and finally up to the grounds of the hospital, the chances are good that you will see deer, turkey, and perhaps a groundhog or two. Going north from the hospital, you can pedal 3.5 miles of mostly flat road before doing a 180 for another run, or bear right and make a one mile loop that includes a hill steep enough to make those legs burn. Another option as you ride north past Hamm Road is to turn hard right on Manufacturers Road for a short loop or angle right less than half mile further onto West Elmwood, which takes you up to Dayton Pike near the tunnel through Stringer’s Ridge. You can zoom back down to the North Shore on Cherokee Boulevard or turn left before the tunnel to ride Red Bank. As with any potential paradise, there's a catch. In addition to National Park Service trails, historical sites, and a first-rate golf course, the Bend is home to a sewage treatment plant. On some days, there is virtually no smell at all. Most people find they can tolerate even the smelliest of days because depending on the wind direction, you're moving fast and any odor doesn't last long. Riding the Bend is suited to those looking for an extremely convenient stretch of road for time trails, sprints, or just relaxed conversation with your fellow riders as you admire the scenery and wildlife. Many cyclists park on Hamm Road across the Friends of the Festival office, a half mile from Moccasin Bend Road, although you can also start your ride from anywhere on the North Shore. The best time to ride is either early or late, in part for the wildlife but also because traffic from the hospital and industrial sites tends to be less. Cars and trucks are usually not a big issue here but be mindful and courteous. On the north end of the main road (known as Pineville Road) keep an eye out for two railroad crossings.